North East commercial vehicle rental firm Transflex is celebrating after moving into new headquarters following a period of substantial growth. The Stockton-headquartered company, which has three branches across the UK has moved to its new site located at North Tees Industrial Estate, following a six-figure investment. Established five years ago by co-founders Peter Abdale and Steve Smith, the flexible vehicle rental company is a fast growing business with ambitious growth targets for the year ahead. Turnover for 2016 reached £16.1m which is set to increase to £20m this year with a series of expansions across the UK and investments in customer facilities planned. A new branch in Bristol is under construction and is set to open in May 2017. The company’s senior management team is made up of experienced staff. Working alongside managing director Peter Abdale are sales director Gary Henry, finance director Tina Lynas and director Nick Skillman. The team has a wealth of rental industry experience gained by working for some of the UK’s largest vehicle rental companies, collectively spanning well over 130 years in the rental sector. The opening of the new site on North Tees Industrial Estate in Stockton, further cements the company’s strong position in the North East business community, employing local people and creating ten new jobs, bringing the total head office and branch headcount to 35. The new 2.5 acre site includes larger office accommodation, an improved rental desk and a used vehicle sales office together with a large parking area providing significantly increased capacity for additional vehicles. Its location is ideal for access to the main transport links and allows the company to continue to offer the high quality flexible and responsive service that it has become known for. Abdale said: “We’re delighted to open our new Stockton headquarters and vehicle hire facility. This latest milestone is more great news following a very successful year, as we see our turnover grow and we expand our customer base. 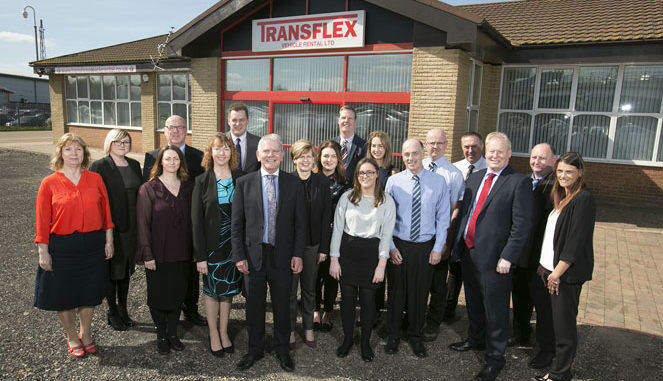 Transflex now employs 80 people across three branches – Stockton, Buckingham and Warrington. It provides flexible rental vehicles for businesses, offering their customers the freedom to change or return vehicles at any time without notice or penalty. The company was recently named 13th in the Sunday Times Fast Track 100 League.